The Allure of Dartmouth: Lower Ferry Opening date! The Lower ferry contractors and SHDC, the ferry operators met today to discuss the opening date for the ferry. 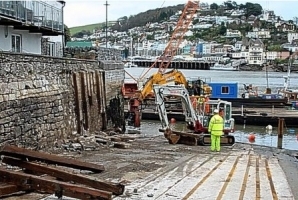 It has now been confirmed a short time ago by Trevor Finch, who is responsible for this service, that the ferry will open on Tuesday 21st May at the normal operating time for the ferry which is 7 am from Dartmouth and 7.10 am from Kingswear. The whole town is very pleased to hear this news!